There are so many great new features on the 2016 Honda Odyssey, and so many reasons to buy one, that you owe it to yourself and your family to test-drive it now at Honda of Jefferson City, MO. You ought to see its 248-hp 3.5L V-6 with cylinder deactivation and fuel injection move along the highway; you should bask in its eight-person luxurious interior; you need to check out the amazing built-in vacuum cleaning system in the cargo area. See all of the above, and many more dazzling features of the 2016 Odyssey, at Honda of Jefferson City, MO, where your satisfaction means a great deal! 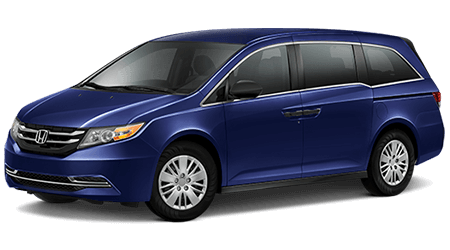 We have a large selection of new Odysseys for your approval, including the elusive Honda Odyssey Touring Elite with a 12-speaker Premium 650-Watt Audio System with 12 Speakers, and both a USB port and a 115-volt AC power outlet. If you want some good clean fun the whole family will really enjoy, buy a 2016 Honda Odyssey and fill up the tank. As mentioned, there are so many reasons to buy the new Odyssey, we can only mention the highlights below. But please don't buy it just for the innovative and exclusive built-in HondaVAC® vacuum cleaner, because in a few years, all minivans will have them. One visit to our comfortable showroom at 3625 Missouri Blvd in Jefferson City, MO will show you that we go the extra mile to get you in a Honda vehicle that is perfect for your lifestyle, and your budget. If you live in or near our sister cities of Jefferson City, and Jefferson City, and you have a family, you owe it yourself to see the 2016 Honda Odyssey in all its family-friendly glory at Honda of Jefferson City, MO.